The impression that you leave during a first meeting is like a “business card”. When introducing yourself, you make yourself a good or less good name. Same when handing over a business card. We from Holz & Technic support you to leave a good impression on your clients and visitors. With us you gain an essential competitive advantage while searching for new clients and business partners: Become unique! We are convinced that you are already successful, but does a prospective customer recognize that at the first glance? Shall the first encounter with your company lead to a positive impression or a favorable attitude towards you? Then facilitate your exclusive experience and pin point directly who you are. 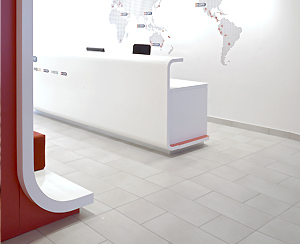 Together with us you can design the most important “business card” – your showroom, your entrée or your reception area with a counter.